Learn how to design efficient, cost-effective, future-ready cable network systems and watch your job prospects soar. 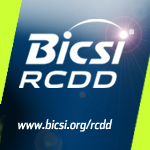 BICSI, the worldwide ICT association, can guide you along a career path that leads to the most elite design credential: Registered Communications Distribution Designer (RCDD®). Take the first step to becoming an RCDD now. snom technology, a leading developer of IP desktop business phones, has updated its flagship line of phones with a streamlined new look, new branding and an upgrade of the internal processor that powers the handset. The new D715 and D725 IP desktop phones now feature a Broadcom chipset for improved horsepower to handle current and future Unified Communications applications. Both models are now black with a sleeker design. The D725 is the ultimate in functionality, with 18 multicolor function keys, wideband audio, Gigabit Ethernet and a USB port for expansion. With 12 SIP identities (or lines), the D725 is ideal for call-intensive business environments.